Israeli archeologists have uncovered a monumental Second Temple structure opposite the Temple Mount that was likely Queen Helena's palace, the Israel Antiquities Authority announced Wednesday. 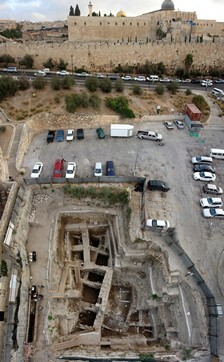 The building was unearthed during a six-month excavation in the Givati parking lot just outside the Old City's Dung Gate, ahead of the planned expansion of the Western Wall parking lot. The site also indicates that the ancient City of David was much larger than previously thought, said archeologist Doron Ben-Ami, who is directing the dig at the site. The palace, which was destroyed by the Romans when they demolished the Second Temple in 70 CE, was dated to the end of the Second Temple period by pottery and stone vessels, as well as an assortment of coins from that time, Ben-Ami said. He said the elaborate edifice, which is an anomaly in the landscape of the lower city at the end of the Second Temple period - otherwise marked with only modest buildings - was probably a palace built by Queen Helena, a wealthy Babylonian aristocrat who converted to Judaism and moved to Jerusalem with her sons. Helena became known for her generosity in helping the city's poor during a famine. She was buried in Jerusalem. The site of the dig. According to the prominent 1st century historian Josephus, Helena's family built lavish buildings in the City of David, which stood out at the time in a largely residential area that was noted for its almost complete absence of public or monumental buildings. The archeologists carrying out the dig have not yet found any inscription to identify the building they uncovered, but Ben-Ami said there was a "high probability" that the site was indeed Helena's palace. "We need more evidence to decide, but almost everything fits," he said. The well-preserved structure being uncovered in the excavation is an impressive architectural complex that includes massive foundations; walls, some of which are more than five meters tall and are built of stones that weigh hundreds of kilograms; halls that are at least two stories tall; a basement level that was covered with vaults; and remains of polychrome frescoes, water installations and mikvaot. The narrow openings that were discovered in the basement level of the structure were likely used by its inhabitants to flee shortly before the Romans destroyed the palace, Ben-Ami said. The building was destroyed by dismantling the walls of the large structure, causing the massive stone walls and ceilings from the upper stories to collapse onto the basement. The large edifice was covered with remains that date to later periods - Byzantine, Roman and early Islamic. Below it there are remains from the early Hellenistic period and artifacts from the time of the First Temple. "It is like an open history book of Jerusalem," Ben-Ami said.